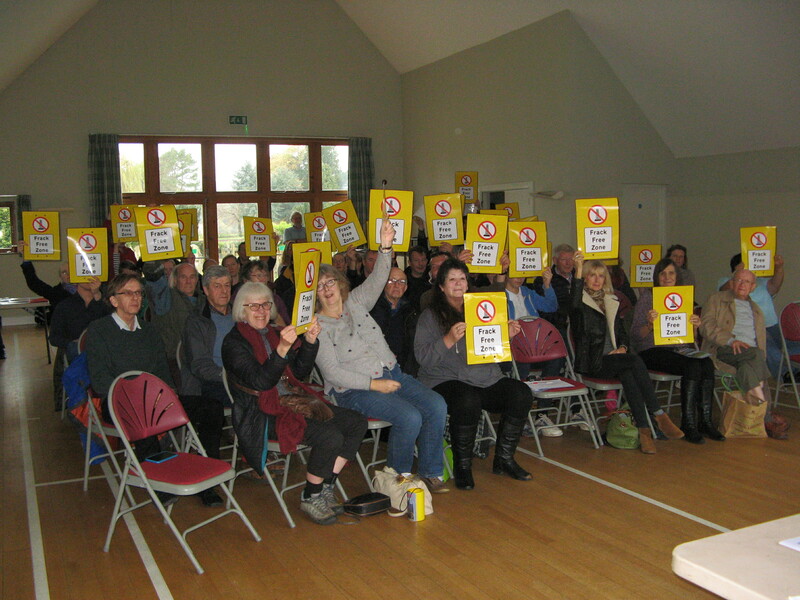 More than 70 people turned out on a rainy Saturday in Oxted for a great community meeting on fracking. As well as a couple of short films, we were treated to a series of informative and inspiring short talks. Brenda Pollack, the South East Regional Campaigner from Friends of the Earth, who supports many local anti-fracking groups across the region, gave a brief introduction to what fracking is and why many people oppose it due to the risks of air and water pollution. She pointed out that research shows that unconventional wells are four times more likely to fail than conventional ones and that research coming in from countries where fracking has been happening is showing that there can be health impacts. Rob Basto from Frack Free Surrey spoke about the impacts of climate change around the world, including droughts in Africa and California, forest fires in Australia, and a tripling of extreme weather events worldwide. He said that world temperatures have so far risen by one degree Celsius since the industrial revolution, but could go up by two degrees or more if we don’t switch to a different energy path quickly. Rob outlined the threats, including reduced food production, leading to wars and starvation, and said, “We clearly need to take climate change seriously – we’re in a dangerous situation but it’s our children and grandchildren who will suffer the effects in this country. We’ve got huge renewable resources – we can switch to renewable energy.” He stressed that we should object to conventional oil wells, not only those that involve fracking. Helen Savage from Balcombe told how when fracking company Cuadrilla arrived in her village, she did her own research and quickly saw that the industry, the government and the media were all spinning myths. She then exposed some of the most commonly cited myths – for example that ‘fracking has been happening here for years’. In fact, only one well has been high-pressure fracked in the UK; that was Preese Hall, which caused an earthquake. Comparing old-fashioned fracturing with the modern technology is like comparing a corner shop to a hypermarket. Helen pointed out that while much of the discussion nationally is about fracking for gas, in Balcombe, and probably elsewhere in the Weald Basin, the target is oil, which is why acid stimulation is used. She said, “They will tell you that they’re ‘not fracking’ – but stimulating a well with acid for oil is a growing problem in America. It is still likely to be unconventional: involving cluster drilling and multi-well pads with long laterals; radioactive flaring; radioactive waste; fluid containment issues; compressor stations; noise of drilling flaring and pumping and heavy industrialisation. Oxted resident Phil Davies listed the various locations nearby that are covered by Petroleum Exploration and Development Licences (PEDLs), the first step in the process of being able to drill. At Leith Hill, Europa Oil and Gas recently gained permission to drill for oil at a planning appeal and at Horse Hill, near Horley, Horse Hill Development Limited has applied for permits to flow-test the well it drilled last summer. Phil spoke about the threats of air and water pollution and pointed out that France has banned fracking, Germany has put tight restrictions on it and the Netherlands has a moratorium on the technology. Meanwhile our Government, looking to replace the revenues it used to receive from North Sea Oil, is going it alone in Europe in supporting the fracking industry. In the following discussion, a number of interesting points were raised. Lawrie Dunn, a chemical physicist and Balcombe resident, answered questions on the chemicals used, and resulting pollution risks. He said that in Balcombe (where flaring has not yet taken place) the flare only has to be monitored for a few compounds, including NOx and VOCs, but not for others, for example polycyclic aromatic hydrocarbons, which are serious cancer-causing compounds. He said that the flare stacks do not compare with those on waste incinerators, which are much higher and hotter than those used on oil and gas drilling sites. He said that a particular concern is the proposal to use hydrofluoric acid, which will react with rock to produce some very dangerous compounds. John Ashton, a former Special Representative for Climate Change who worked for three successive UK Foreign Secretaries, said that at one time, the UK Foreign Office’s diplomacy-led approach to climate change was widely admired. He spoke of his dismay at the current Government’s dismantling of the system of targets and incentives that had been put in place, and said, “We are now being left in the dust. Our government is saying we need fracking for energy security but it’s nonsense – low-carbon technologies are transforming the economies of other European countries”. The meeting ended with a commitment to continue to strongly oppose fracking or unconventional oil and gas exploration and exploitation in Surrey, and everyone was encouraged to sign and share a petition to Surrey County Council asking them to ban all fracking in the county. Amelia Womack, Green Party Deputy Leader, and Peter Sims, Guildford Young Greens, will speak at this meeting, organised by Mole Valley and Reigate and Banstead Green Party branches. Join the biggest climate march ever planned in the UK. As politicians set off for the Paris climate talks, our demands need to be ringing in their ears: No to dirty energy; yes to renewables and climate jobs; justice for those affected by climate change.